The Demuth Museum in Lancaster, PA offerred the exhibition "Demuth in the City of Lights," on view through August 28, 2011. This exhibition brings together many of Charles Demuth’s works from his travels to Paris in the early twentieth century. American Modernist painter Charles Demuth (1883-1935) soaked up all Paris had to offer by visiting galleries, attending live performances, discussing ideas with fellow artists including Marsden Hartley and Marcel Duchamp, and drinking up the night-life. Upon returning home to Lancaster, he poured out his art work. Like other foreigners in Paris, Demuth did seek out art instruction and this exhibit featured examples of Demuth’s figure drawings of live models from his classes at the Academie Colarossi and the Academie Julien. This exhibition also highlighted Demuth’s pictures of the people and places he saw during his time in France, including portraits of such notables as Igor Stravinsky and Alice B. Toklas, landscapes such as a lively beach scene from the French coastal town of Étretat; and some vibrant watercolors from the many stage performances Demuth attended while in Paris. 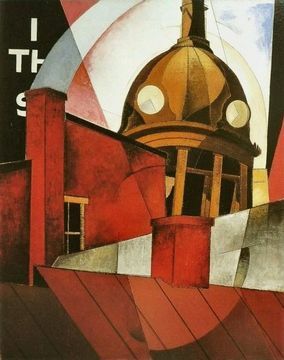 This exhibit was the Demuth Museum’s largest exhibition about the artwork and life of Charles Demuth for the year and features works drawn from the Demuth Museum’s permanent collection of over forty originals as well as a several rarely exhibited pictures from private collections. The Demuth Museum, established in 1981, is dedicated to developing awareness, understanding and appreciation of the artwork and legacy of Charles Demuth (1883-1935). As a leader of the American Modernist movement, Demuth is best known as a pioneer of the precisionist style and a master watercolorist. Located in the artist’s former home and studio in Lancaster, Pennsylvania, the Demuth Museum has a permanent collection of 40 Demuth works, along with an extensive archive and library. Regular Museum Hours: Tues-Sat 10-4 and Sunday 1-4. Admission is by donation.